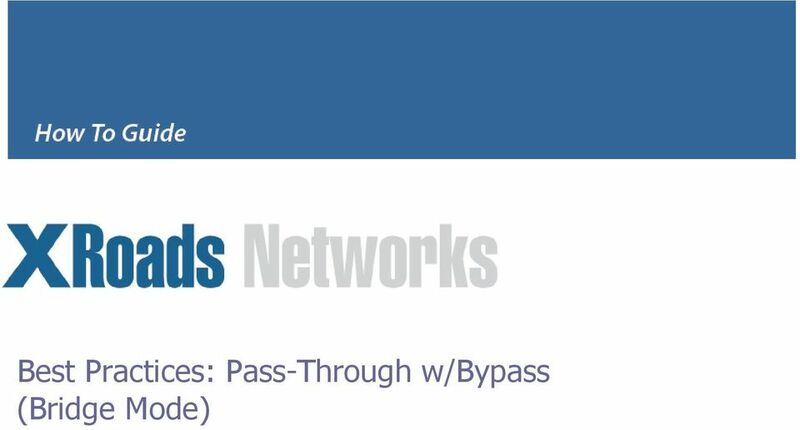 Download "Best Practices: Pass-Through w/bypass (Bridge Mode)"
2 EdgeXOS Deployment Scenario: Bridge Pass-Through This document is designed to provide an example as to how the EdgeXOS appliance is configured based on a predefined scenario. The scenario is typical of many customers and is outlined below. If you have any questions about this document or how this scenario might differ from your actual deployment, please feel free to contract our support center. Support URL: Additional documentation is available on our website via our Support link, select the Documentation option. We also have a number of how-to videos online here: Video (Step-by-Step Support) URL: Scenario Details: The following outline provides some predefine requirements for this scenario. Most of these requirements are taken from previous customer installs and real-world deployments. - Must be able to perform a transparent installation, meaning no changes to the existing network architecture or IP address space. - Must be able to load balance outbound end-user traffic across all three WAN links and provide automated failover in the event of an outage on any of the links. - Must be able to pass-through VPN tunnel to gateway firewall appliance through the WAN1 link. - Must be able to provide inbound SMTP server failover from WAN1 to WAN2 in the event of a network WAN1 failure. - Must be able to load balancing incoming web traffic between all three WAN links to an IP address assigned to the firewall. - Must be able to maintain session persistence for critical CRM application. - Must be able to offload non-critical web traffic over our WAN2 link. - The customer has 250 end-users sitting behind an existing firewall. - The customer has an existing publicly routed network from WAN1. - The customer has two additional links which each have 5 static addresses. 5 WAN1 interface of the appliance (note this may require a cross-over cable). Plug in the appliance and turn it on, the appliance takes approx 60 seconds to boot. NOTE: When using proxy mode it is very important that the WAN1 interface of EdgeXOS and the LAN interface of the gateway router are directly connected, meaning no switches or other equipment can sit between these two devices. 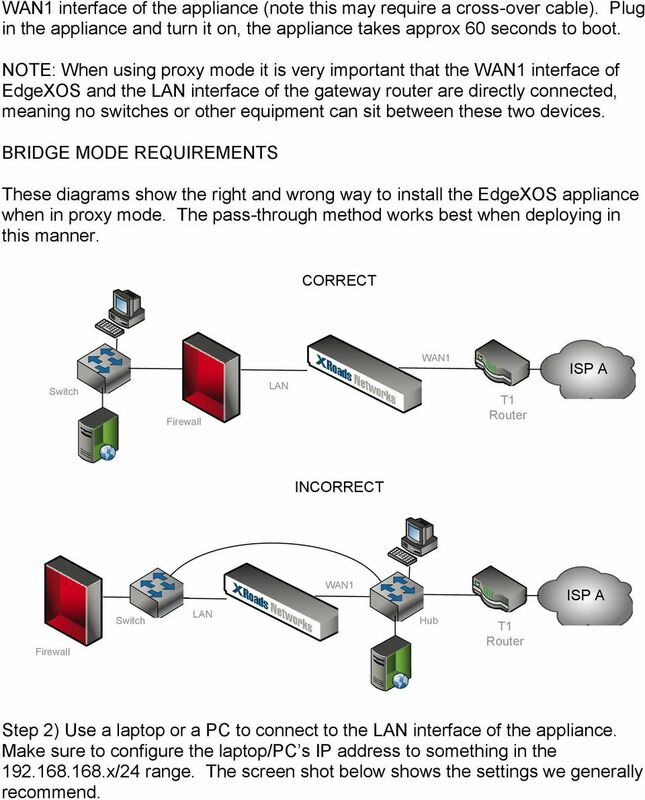 BRIDGE MODE REQUIREMENTS These diagrams show the right and wrong way to install the EdgeXOS appliance when in proxy mode. The pass-through method works best when deploying in this manner. CORRECT Switch Firewall LAN WAN1 T1 Router ISP A INCORRECT Firewall Switch LAN WAN1 Hub T1 Router ISP A Step 2) Use a laptop or a PC to connect to the LAN interface of the appliance. Make sure to configure the laptop/pc s IP address to something in the x/24 range. The screen shot below shows the settings we generally recommend. 6 Connect to the LAN interface from the NIC of the laptop/pc (note a cross-over cable may be required to do this). Make sure that you see a green light on the EdgeXOS appliance s LAN interface when it is plugged in. If a green light does not appear the cable may not be working correctly or the interface on the laptop/pc may not be enabled. Step 3) Once connected first perform a PING operation to make sure that your computer is able to access the appliance over the network. This operation can be conducted on a Windows system via the Start menu. 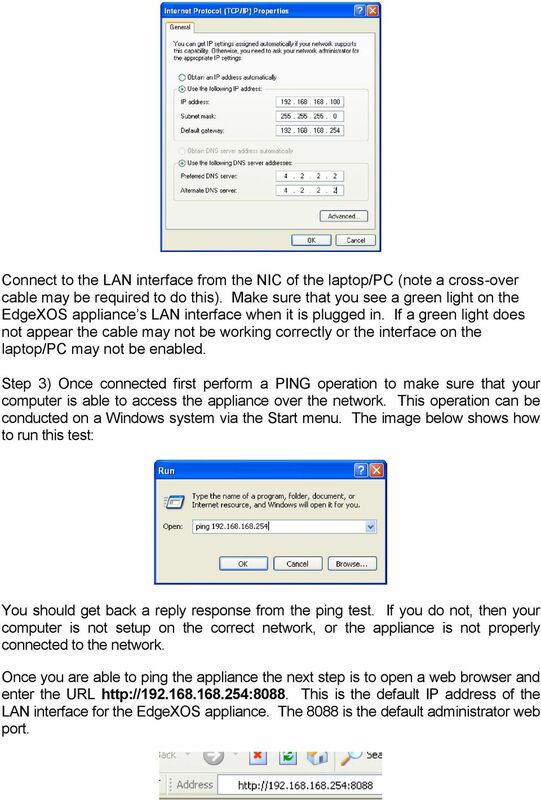 The image below shows how to run this test: You should get back a reply response from the ping test. If you do not, then your computer is not setup on the correct network, or the appliance is not properly connected to the network. 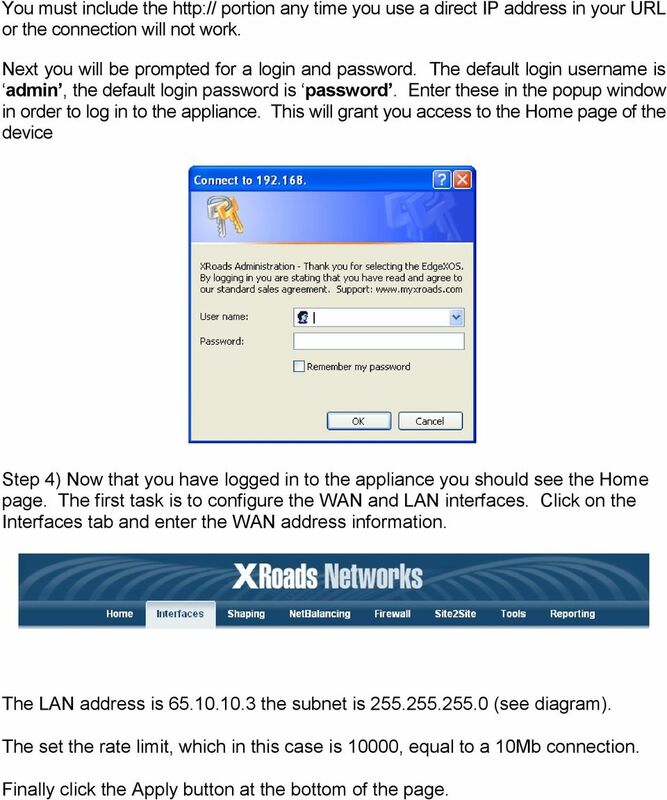 Once you are able to ping the appliance the next step is to open a web browser and enter the URL This is the default IP address of the LAN interface for the EdgeXOS appliance. The 8088 is the default administrator web port. 7 You must include the portion any time you use a direct IP address in your URL or the connection will not work. Next you will be prompted for a login and password. The default login username is admin, the default login password is password. Enter these in the popup window in order to log in to the appliance. 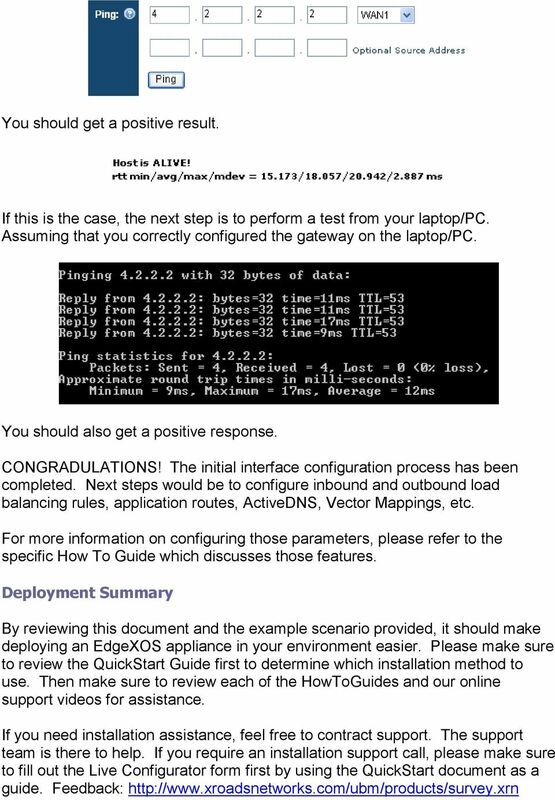 This will grant you access to the Home page of the device Step 4) Now that you have logged in to the appliance you should see the Home page. The first task is to configure the WAN and LAN interfaces. Click on the Interfaces tab and enter the WAN address information. The LAN address is the subnet is (see diagram). The set the rate limit, which in this case is 10000, equal to a 10Mb connection. Finally click the Apply button at the bottom of the page. 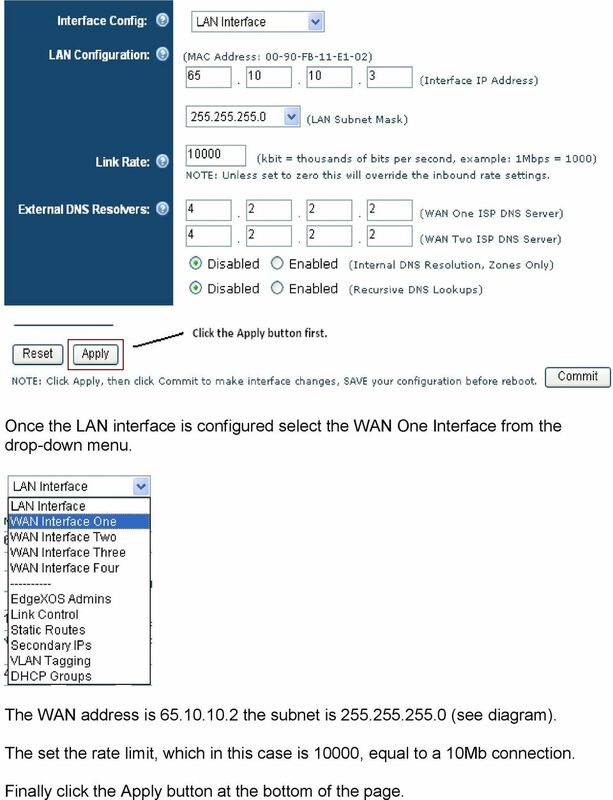 8 Once the LAN interface is configured select the WAN One Interface from the drop-down menu. The WAN address is the subnet is (see diagram). The set the rate limit, which in this case is 10000, equal to a 10Mb connection. Finally click the Apply button at the bottom of the page. 9 Do not Commit the interfaces yet. It is typically best to configure both the LAN and WAN1 interfaces before committing the interfaces. Step 5) Once you have configured bridge mode, it is important to add administrative devices, i.e. those devices which will be used to administer the appliance in the future. The reason for adding this information is to ensure that the appliance maintains this information in its bridge state. 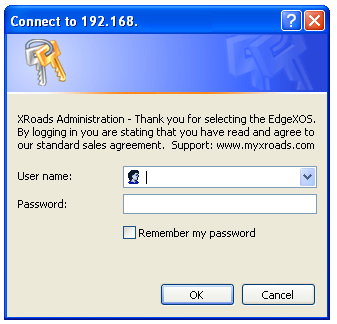 To add this information, select EdgeXOS Admins from the Interfaces drop-down menu. Now add all LAN and WAN sides addresses which will be used to configure the appliance, including any temporary addresses you are using for this setup. 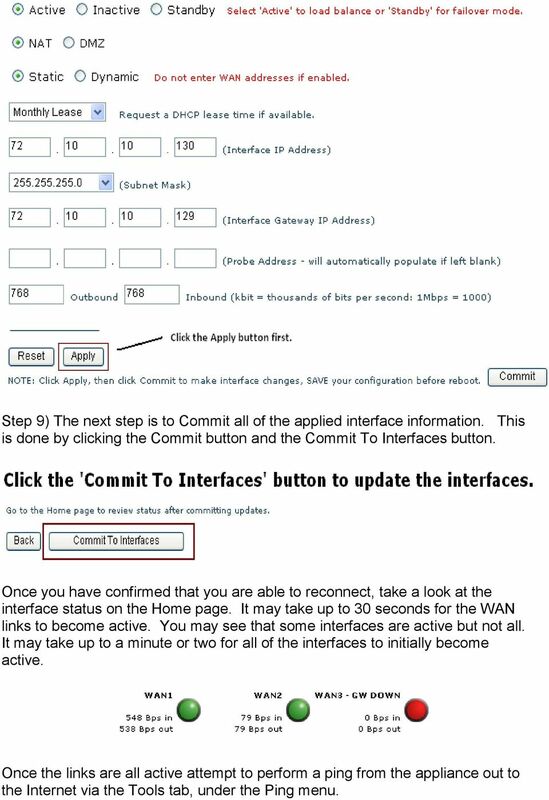 10 Step 6) Prior to configuring any other interfaces we want to Commit the applied interfaces to the interfaces and make sure that the WAN1 proxy is working. 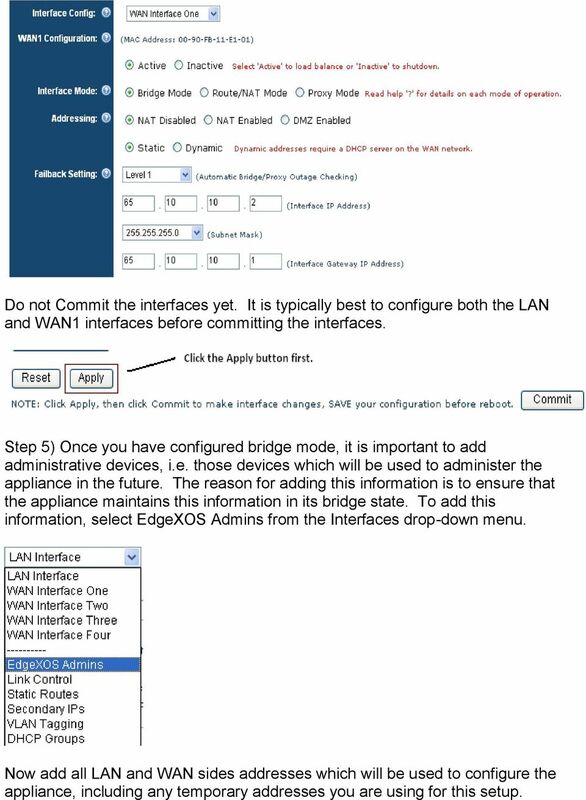 Once committed the interfaces on the EdgeXOS appliance will automatically be updated with the LAN and WAN interfaces changing to the new state. NOTE: At this point you will lose access to the web-gui. You now need to change the IP address of the laptop to be equal to the new subnet. 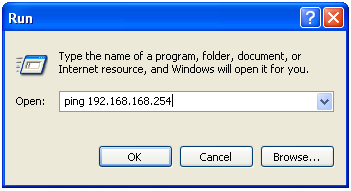 In this case the laptop/pc needs to be changed to something like with a subnet and a gateway of Once the address has been changed you should be able to reconnect using the new URL: At this point you want to SAVE the configuration via the Save button on the Home page. 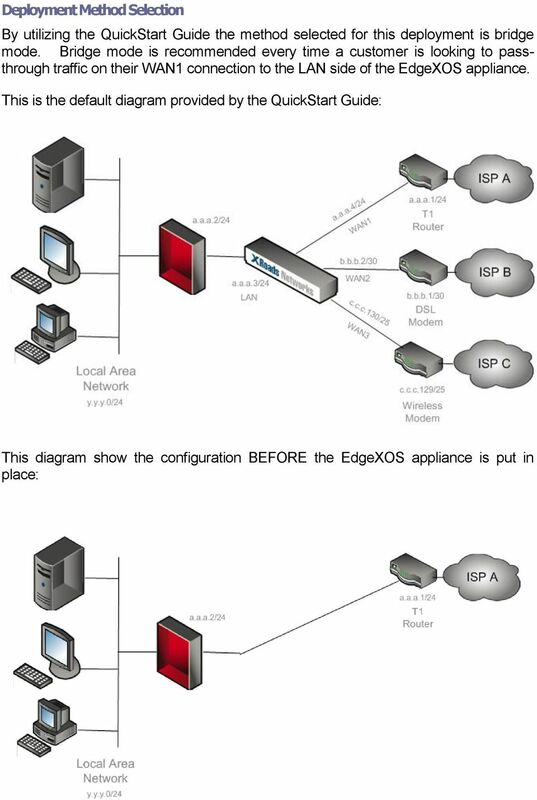 Once the configuration is saved you will need to plug the LAN interface of the EdgeXOS appliance in to the firewall device. IMPORTANT: The appliance should now be operating in pass-through bridge mode, which means that all traffic from the LAN firewall should be going directly out through the WAN1 gateway router. The EdgeXOS appliance does see this traffic however at this time it is simply acting as a switch for the WAN1 network. 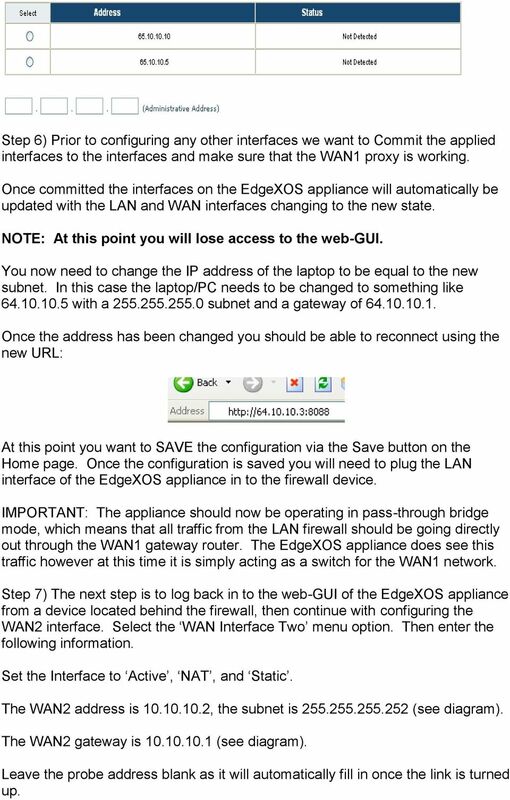 Step 7) The next step is to log back in to the web-gui of the EdgeXOS appliance from a device located behind the firewall, then continue with configuring the WAN2 interface. Select the WAN Interface Two menu option. Then enter the following information. Set the Interface to Active, NAT, and Static. 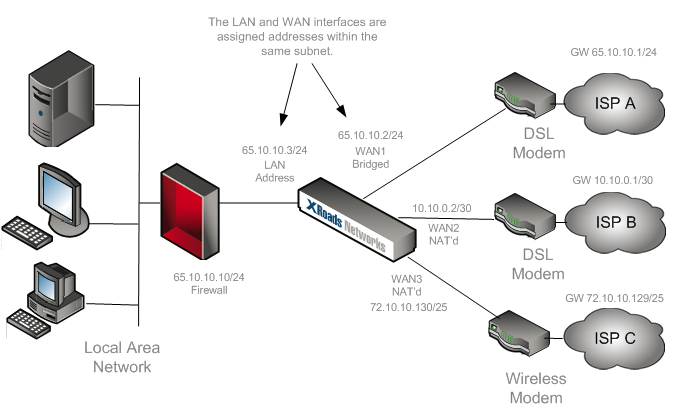 The WAN2 address is , the subnet is (see diagram). The WAN2 gateway is (see diagram). Leave the probe address blank as it will automatically fill in once the link is turned up. 11 The set the rate limit, which in this case is 3000, equal to a 3Mb connection. Finally click the Apply button at the bottom of the page. 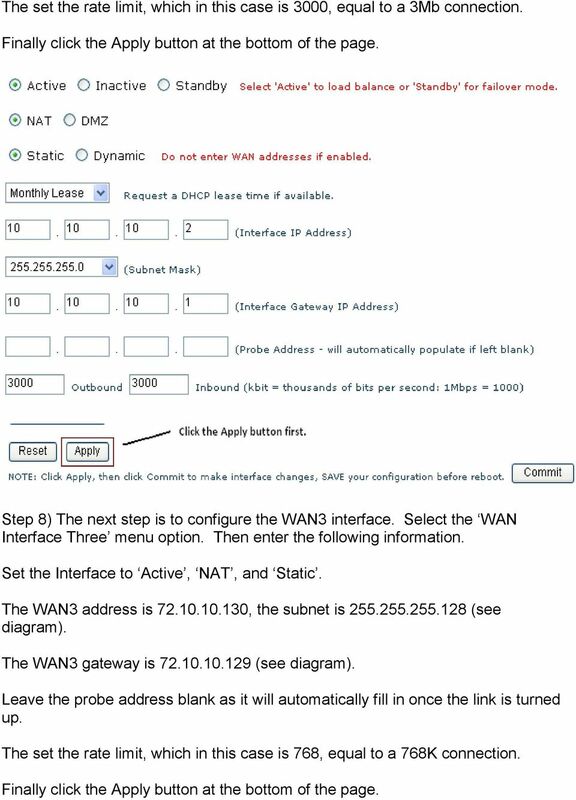 Step 8) The next step is to configure the WAN3 interface. Select the WAN Interface Three menu option. Then enter the following information. Set the Interface to Active, NAT, and Static. The WAN3 address is , the subnet is (see diagram). The WAN3 gateway is (see diagram). Leave the probe address blank as it will automatically fill in once the link is turned up. The set the rate limit, which in this case is 768, equal to a 768K connection. Finally click the Apply button at the bottom of the page. 12 Step 9) The next step is to Commit all of the applied interface information. This is done by clicking the Commit button and the Commit To Interfaces button. Once you have confirmed that you are able to reconnect, take a look at the interface status on the Home page. It may take up to 30 seconds for the WAN links to become active. You may see that some interfaces are active but not all. It may take up to a minute or two for all of the interfaces to initially become active. Once the links are all active attempt to perform a ping from the appliance out to the Internet via the Tools tab, under the Ping menu. How to Setup PPTP VPN Between a Windows PPTP Client and the DIR-130. This article describes a detailed configuration example that demonstrates how to configure Cyberoam to provide the access of internal resources. 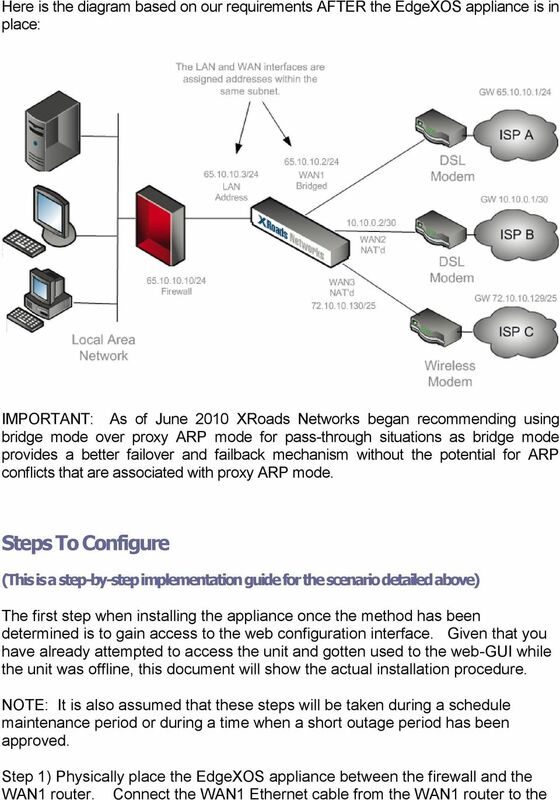 Network/VPN Overlap How-To with SonicOS 2.0 Enhanced Updated 9/26/03 SonicWALL,Inc.